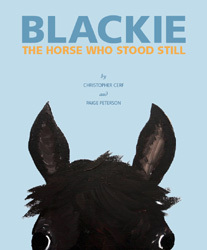 His coat was coal black so they named the horse "Blackie,"
Standing here in the shade of a juniper tree...."
Blackie, The Horse Who Stood Still, is a children's book written by Christopher Cerf and Paige Peterson about Tiburon’s own Blackie. Published by the Tiburon Peninsula Foundation and Welcome Enterprises, the playful, rhyming text and Paige's lyrical full-color illustrations tell the (mostly) true story of Blackie, a horse who made standing still a lifelong endeavor, while at the same time becoming a champion rodeo horse, a tourist favorite at Yosemite National Park, a legendary environmental crusader, and the beloved mascot of one of America's most beautiful towns—Tiburon. The book delivers an important message about appreciating and preserving the natural beauty around us and is on the way to becoming a children's classic. TAKE A LOOK AT SOME PAGES IN THE BOOK! Christopher Cerf, is an author, composer-lyricist, and television producer. Cerf played a pivotal role in the creation and production of “Sesame Street,” most notably as a regular contributor of music and lyrics. He has won eight Emmy Awards and two Grammy Awards. Paige Peterson is a noted and widely exhibited artist who has been selected for membership in the prestigious Guild Hall Academy of the Arts in East Hampton, New York. 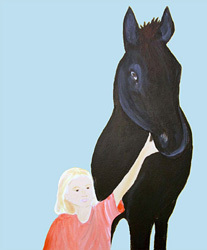 As a child in Belvedere, California, she often fed Blackie apples, carrots, and sugar cubes in his pasture. She has recently illustrated Jesse Kornbluth’s edition of “A Christmas Carol.” A Senior Vice President of the Huntsman Cancer Institute, Paige lives and works in New York City and Belvedere, California..